The painting includes 15 scenes from the lives of Jesus Christ and the Virgin Mary, including the Annunciation and the Passion. Those depicted wear traditional Japanese clothes and items. Christianity arrived in Japan in 1549. Warlord Toyotomi Hideyoshi issued an order to expel Christians in 1587. The Tokugawa shogunate, during the Edo period, banned the religion in 1612. 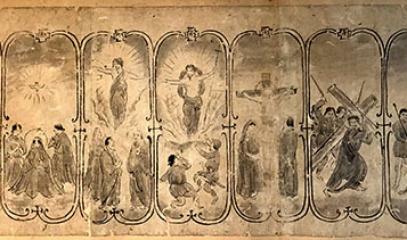 Tokyo (AsiaNews/Agencies) – Experts from the Yokohama History Museum have dated a rare work of art (pictured) that depicts Christian worship and prayers. The scroll – created in sumi black ink on a piece of traditional washi Japanese paper 22 cm high and 320 cm long – dates back to the 16th century when Christians were persecuted. The painting, part of a collection at the Sawada Miki Kinenkan Museum, in the town of Oiso, Kanagawa Prefecture, has been on display in the Yokohama museum since 23 November. The piece depicts 15 scenes from the lives of Jesus Christ and the Virgin Mary, including the Annunciation and the Passion. It also includes descriptions in Japanese of Latin prayers. People in the painting wear traditional hakama clothing, with some carrying what appear to be swords. It was apparently based on a western religious painting and used as a devotional item by Japanese Christians of that time. Japanese characters written at the end of the painting suggest it was created by a believer in 1592. By using radiocarbon technology to date the washi, the research institute found that the paper was made between 1556 and 1633. “[T]his is one of the oldest Christian paintings in Japan,” said Osamu Inoue, deputy head of the Yokohama museum. 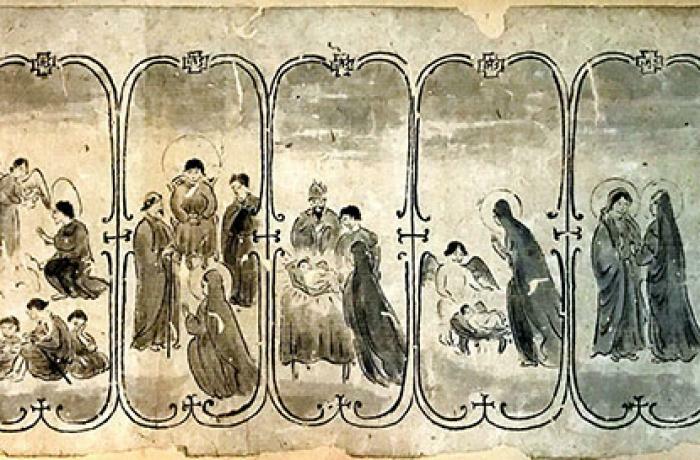 Yukihiro Ohashi, a professor in the history of Christianity in Japan at Waseda University, said the painting shows how people around the time devoted themselves to the religion. After Christianity was introduced to Japan in 1549, Daimyō (feudal lord) Toyotomi Hideyoshi issued an order to expel Christians in 1587 and the Tokugawa shogunate during the Edo Period banned the religion in 1612. Sawada Miki Kinenkan is known for its collection of items from hidden Christians. The museum found the Christian painting among its holdings but does not know where the work came from. The latest finding adds another piece to the rediscovery of Japan’s Christian history. In July, some 12 hidden Christian sites in Nagasaki and Amakusa became world UNESCO heritage sites. They symbolise anti-Christian persecution in the Edo period (1603- 1867). On 1 April, the Diocese of Nagasaki inaugurated a museum dedicated to the history of Japanese Christianity inside the old bishop’s residence.